The alleged arrival of Nigerian Prophet T.B. Joshua to the nation of Zimbabwe "in the coming days" continues to make headlines with flights and hotels around Harare and Victoria Falls "fully booked" in anticipation. The visit, which comes on the invitation of President Emmerson Mnangagwa, has drawn parallels with Joshua's last high-profile visit to an African President in November 2015. On that occasion, the cleric visited Tanzania where he was personally received at the airport by President John Magufuli. 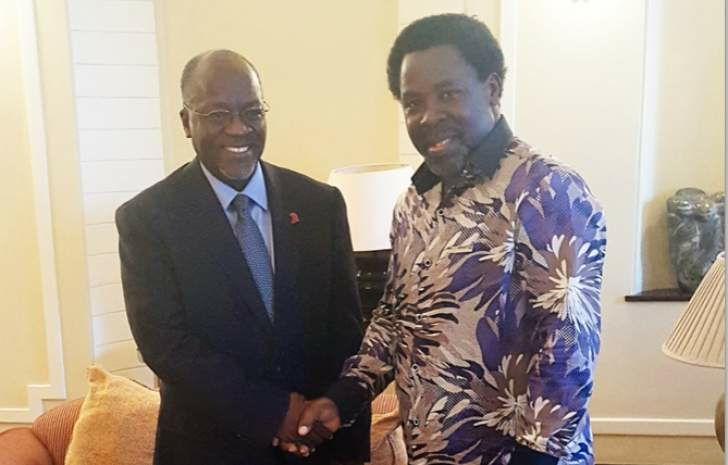 His visit sparked a media storm with front page coverage of his additional meetings with the outgoing leader Jakaya Kiketwe and reconciliatory talks with aggrieved opposition leader Edward Lowassa. Magufuli has been lauded internationally for his crackdown on corruption and economic reforms in the East African nation since his assumption to power, winning numerous accolades in the process including the Mandela Peace Award last year. He has described Joshua as a "close friend" and media reports revealed 'The Bulldozer' as an avid follower of the Nigerian televangelist who visited The Synagogue, Church Of All Nations (SCOAN) long before he even nursed his presidential ambitions. In a video uploaded to YouTube documenting the cleric's visit, Magufuli's eldest son is heard testifying that Joshua's prayers 'healed' him from a severe respiratory problem. Magufuli's wife Janeth also vocally thanked Joshua for inspiring her to engage in charitable work. She was also seen publicly at The SCOAN in November 2016 shortly after she had been released from hospital due to ill-health. The SCOAN in Lagos, Nigeria is renowned for attracting dignitaries worldwide, including the new President of Liberia, George Weah, who visited in October 2017 just weeks before his decisive victory in the run-off elections. In related news, Joshua released a statement mourning the death of Zimbabwean opposition leader Morgan Tsvangirai, who visited his church on several occasions. "May the Almighty God console the people of Zimbabwe at this time and give them courage and strength to bear the loss," he wrote in a condolence message released to Twitter and Facebook. "Our God is faithful and true, a Rock against which you can lean your faith, even as the winds of mourning howl around you."